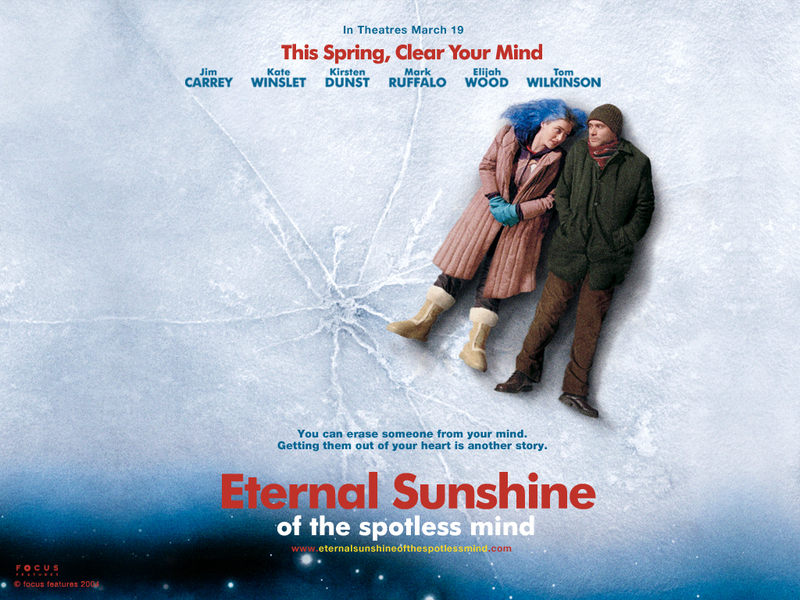 Eternal Sunshine stars Jim Carrey as Joel, an everyman who captures the audiences’ sympathy from the get go. Jaded and average, he does his morning routine only to find himself on a train to Montauk on a freezing February morning instead of going to work. He ascribes it as “waking up in a funk,” but continues to give such self-deprecating comments that make it hard not to empathize with his solitary journey. He’s cynical (“Random thoughts for Valentines’ Day 2004: Today is a holiday invented by greeting card companies to make people feel like crap.”) and awkward (“Why do I fall in love with every woman who gives me tiniest bit of attention?”), which makes the encounter he has with vivacious and spunky Clementine, played by Kate Winslet, all the more quirky and adorable. It’s lovely and funny as missed connections in trains can get, but they hit it off soon enough, spent the evening together, had a first date—the works. Watching this movie on a first and succeeding times are entirely different species. The latter is this tame melancholic experience as it pans out Joel’s prosaic life in the beginning, and then proceeds to surprise with a non-linear storytelling of how Joel and Clementine are, in fact, lovers who had each other erased from each other’s memories. This is aided by uncomplicated sci-fi, which operates under the assumption that there is an emotional core to our memories, and that the eradication of this core supposedly leads to the degradation of love. We witness Michael Gondry’s translation of the inner working of the mind into our screen, and there is such poetic beauty to how this is done. We see how the love story plays backwards, as the process effaces the quarrels and the hurt at the end of the relationship, and proceeds to delete a person in a patient’s head, memory by memory. As Dr. Mierzwiack (played by Tom Wilkins), head-honcho of Lacuna Inc., and his gang of technicians scrub a memory out of a person, we see how nothingness eats up the entirety of a bookstore while the lovers cling together in one spot of light in an attempt to exist. We get to see a beach house where the lovers first met, and we are privy to their residual regrets while the house floods and caves in. The story and the screenplay allow the audience a peek of the physical embodiment of a failed relationship crumbling from the roof down to dust. In here, we see Charlie Kaufman’s genius: all of these are inside Joel’s head. And for many, maybe, it is only after the second viewing that the bafflement clears away, and the carefully constructed narrative reveals itself. Second or third helpings of the movie will feel like witnessing the aftermaths of love, and the gradual reunion.By creating a star-crossed pair with a comically tragic (or tragically comic?) love story, the point is not that people tend to gravitate toward their soul mates, but that they do despite their not being soul mates. For a movie with a very optimistic view of romance, it conveys the fragile nature of love. In the scene at the Charles, we see these two characters playing atop ice, with Clementine surging forward while Joel hesitates a bit. “I think I should go back? What if it breaks?” And Clementine is a light too wonderful for Joel to resist, and persuades him lovingly, “Do you really care about that right now?” So they surge forward, consequences be damned. Never mind that the falling out would feel like drowning in a frozen lake of pain. The wisdom that Eternal Sunshine embedded in this deconstructive drama is that love survives the consequences of its endings. A tape recording of Clementine’s flaws according to Joel plays in the background as they attempt to forgive each other and give it another go was heart-breaking. At that moment wherein everything is exposed for them and the viewers to see—warts and all— the reality of their situation is ringing in both their ears. This is as ugly as relationships get. Knowing that a train meets an imminent tragedy in its travail, do they still get on? But Joel and Clementine’s futile rebellion against the process of forgetting, and that significance-ridden “Okay?” “Okay.” at the end debunk the very precept under which the movie operates. In face of the ruins of memory, vestiges of love remain. That’s the spot of sunshine we all aspire to be blessed with. And if anything, that’s romance, folks.